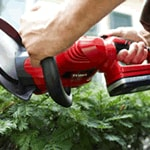 Cordless electric hedge trimmers offer freedom from gas and oil, but also freedom from a cord. They're the best of both worlds, and they're also much quieter than gas models, making them superb for early Sunday morning yard work. Cordless trimmers are a great option for those who want a cleaner, quieter experience with easy start-up. Measure the depth/width of your hedge and choose a blade equal to or greater than the size of your hedge. This will enable you to make smooth sweeps across the tops and sides of your hedges without missing any spots, making the surfaces smooth and level. But don't get a blade that's unnecessarily large. The larger the blade, the heavier the unit will be. It's always best to keep your hedge trimmer as light as possible to improve handling and avoid fatigue. 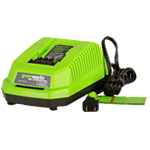 Years ago, NiCad batteries used to be the standard for cordless tools, including cordless hedge trimmers, because of their durability. Remember: trimmer batteries can only hold so much power at a time. A single battery can keep you running for approximately 30-40 minutes depending on the voltage and the charge. If you have a lot of trimming to do, it may be in your best interest to get yourself a backup battery so you can finish your job. You can easily turn one handle of the hedge trimmer to the side to meet your cutting needs instead of twisting your body into a pretzel. Trust us when we say, your back will thank you later. If you've got high hedges to trim, or if you've got deep hedges that make reaching the back sides a pain in the back, you may want to look for a long reach hedge trimmer with a telescoping pole. They allow you to reach as far as 6-1/2 feet. The shaft can be extended or shortened very easily for different trimming needs. Many models also pivot at the trimmer end so you can trim flat tops on taller hedges or trim back the hedges growing against your siding. 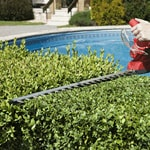 Cordless Hedge Trimmer Buyer's Guide - Find out How to Pick the Perfect Cordless Hedge Trimmer. 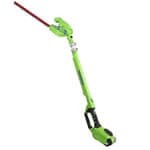 Our string trimmer how-to library can help you pick the perfect electric string trimmer, gas string trimmer, walk behind string trimmer or brush cutter.